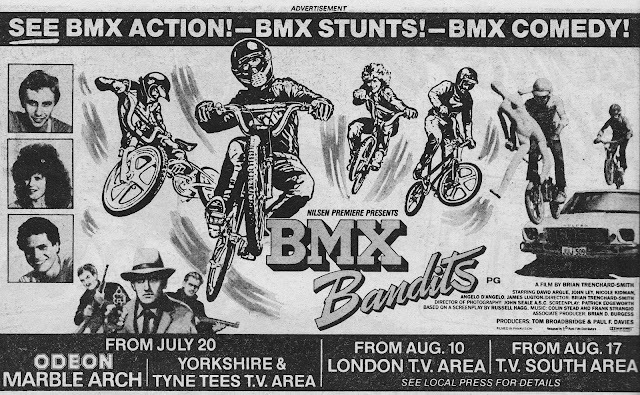 Here's a half-page advert (published in EAGLE cover-dated 30 June 1984) for cult Aussie decade-defining movie BMX BANDITS. What exactly is "BMX Comedy"? Hmmm. Note its sluggish progress around the (TV) regions: it took a mind-boggling month to bunny-hop around the nations' cinemas. And what about everywhere else? Did it even get a national release? I assume this was to save money: allowing a limited number of prints to be circulated around the country, accompanied by TV spots on the relevant local ITV station.